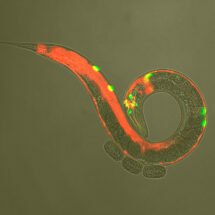 C. elegans co-labelled with markers for neurotransmitter and neuropeptide receptor expression. When an animal detects a stimulus that might signal danger, this primes sensory and motor organs to respond more readily to further stimulation. This is called sensitisation and is one aspect of the more general phenomenon of arousal, in which animals become more alert and can respond more effectively to potential threats. However, the basic principles of how arousal is triggered have not been fully understood. New research from Bill Schafer’s group in the LMB’s Neurobiology Division has identified how sensitisation occurs to control various behavioural states in C. elegans worms at the level of neurons and molecules. Using genetic, behavioural, and imaging approaches, researchers from Bill’s team, including Yee Lian Chew, as well as Isabel Beets from the LMB’s Cell Biology Division and collaborators from Atlanta and Vancouver, were able to identify the neuropeptides and the receptor that allow sensitisation in response to body touch. Neuropeptides are short proteins that are used by neurons to allow communication between them in a similar way to the action of hormones. In this study, the researchers found that the neuropeptide FLP-20 is released by touch-sensing neurons and leads to sensitisation of chemical-sensing neurons and increased movement speed. Yee Lian and Isabel showed that the neuropeptide FLP-20 acts as a signal to convey sensory information from the body to the brain, where a specialised neuroendocrine cell receives the signal and releases more neuropeptides to control many behaviours. This highlights the diversity of signalling roles played by peptides in the nervous system. Neuropeptides are well-known to function as signals from the brain that control targets elsewhere in the body, but their ability to convey sensory information to the brain is less well understood. 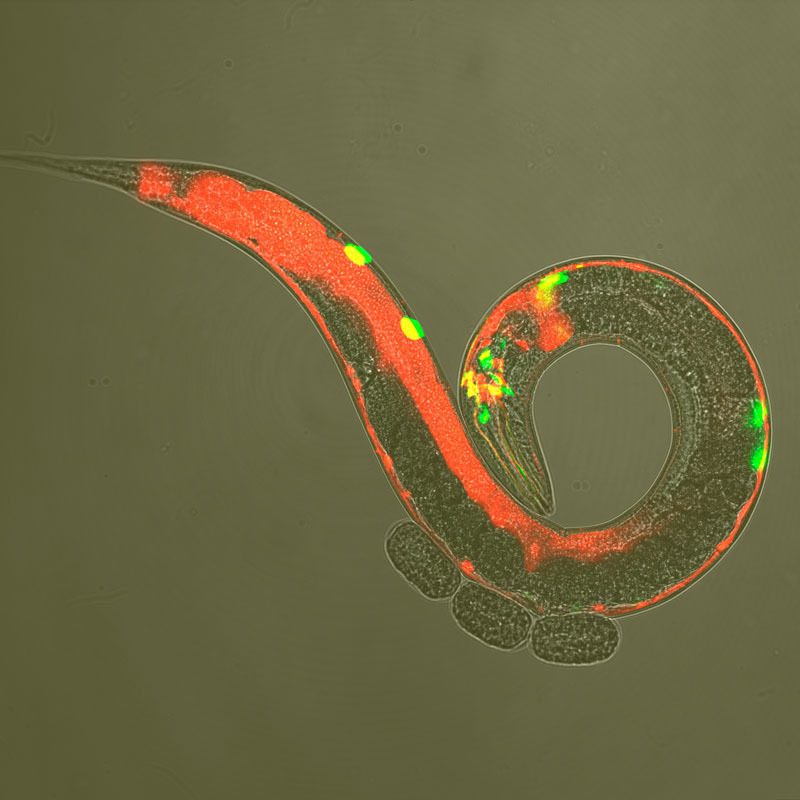 Understanding how neuropeptide signalling operates within neuronal circuits to control complex behaviours in a simple animal like C. elegans will reveal principles that also apply to animals with larger brains, including humans. Neuropeptide signalling is a factor in many mental and neurological disorders, including addiction. Understanding the fundamentals of how neuropeptides interact with neural circuits and their roles in signalling may help develop better treatments. This work was funded by the MRC, National Institutes of Health, Wellcome Trust, Natural Sciences and Engineering Research Council of Canada, and EMBO.